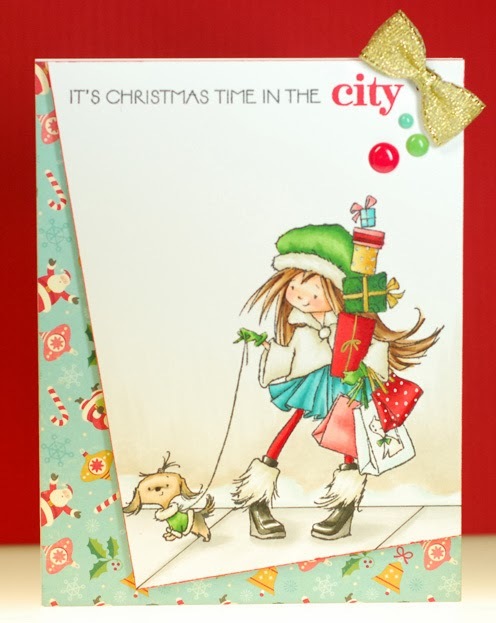 It's review preview day over on the CCD blog and we are shining the spotlight on the newest additions to the CC Designs family. 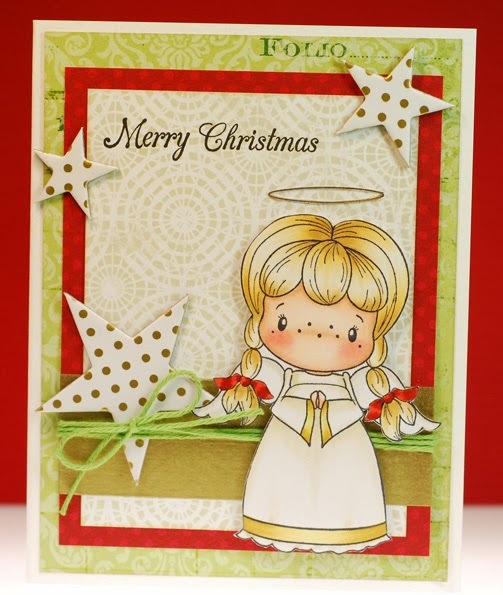 For my card I used the darling Fuzzy Boots Birgitta and have her sitting on the new Snowy Wall scene builder stamp. 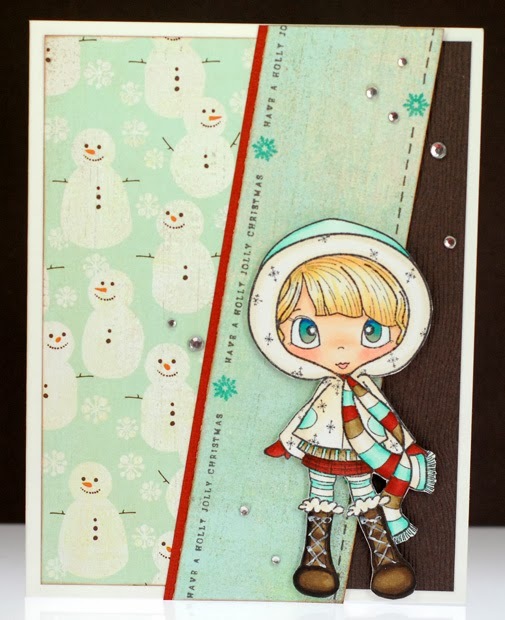 I'm still doing good with my goal to cut into all my Christmas paper pads... this one is Winter Tortellini from Jillibean Soup and it gave me such a fun color palette to play around with. The little touches of pink really suit Birgitta as she rests from all her winter play just outside her happy neighborhood. 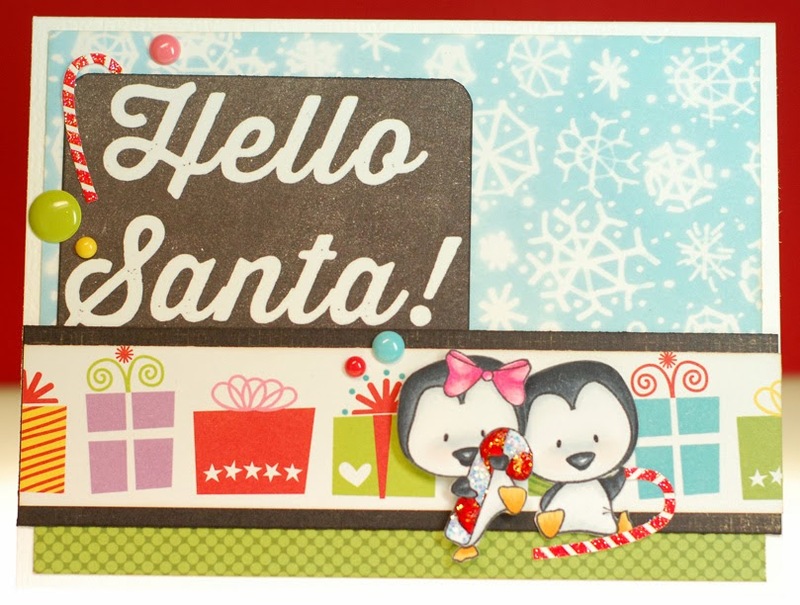 Can you believe there are absolutely no embellishments on this card? 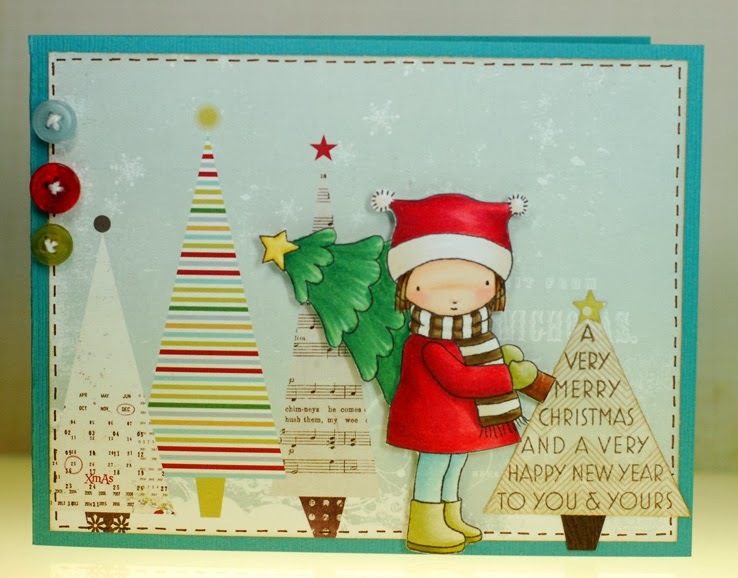 It must be having that wall there because once I got it and Birgitta onto the card base I just couldn't think of anything else that wouldn't detract from the scene if I added it. Sunday I managed to gather all my Christmas 6x6 and 8x8 paper pads together and I'm embarrassed to admit that there were more than I thought. I do have to give myself a pat on the back because over half of them had been cut into and used but there were still about 20 that hadn't been used yet. (>-<) Oy! So now I'm on a mission to use all 20 of those paper pads at least once before Christmas gets here. First to get checked off that list is this Christmas Wish pad by My Mind's Eye that I'm pretty sure I picked up from a daily deal site last year. 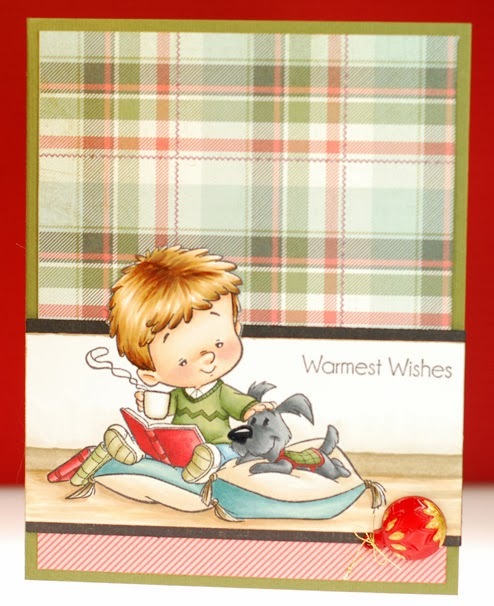 That plaid with the cute stitching detail had me thinking boy card. 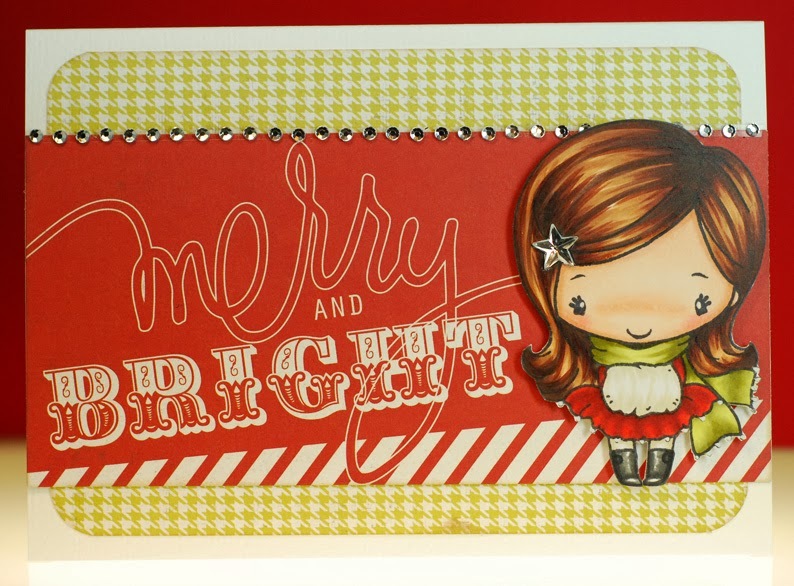 Luckily I also had this sweet Cocoa Cuddles stamp still waiting to get on a card so it was a match made in stamping heaven. 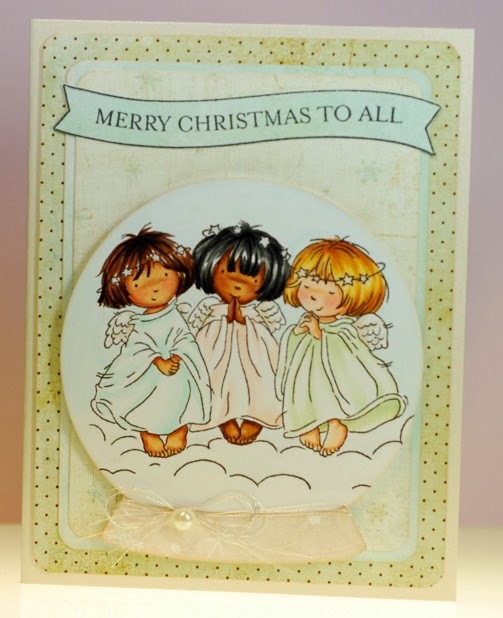 I didn't want to over embellish these two little buddies so a single ornament shaped button was all it took to complete this simple card. Ok, I really should get myself ready for work now. I shall leave it at that and bid you adieu until tomorrow! Alrighty, I got a card made for this week's FFF challenge over at The Greeting Farm using a couple of oldies but goodies. 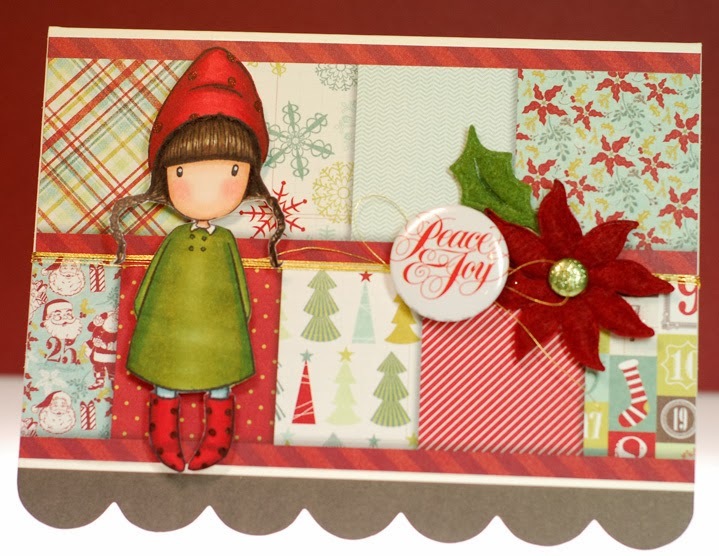 The challenge is to cut it out and since I don't have a Cricut or Cameo machine I just went ahead and fussy cut Wild Sprout Vivi out which allowed me to do a bit of altering and slip a cookie from the Merry Tags set into her arms. 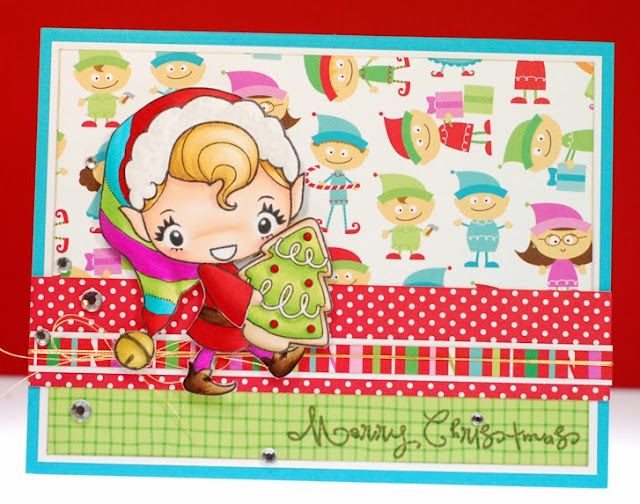 She is such a bright and happy little elf that I just had to pair her up with this fun Doodlebug paper. Now it looks like Vivi is taking a quick break from the toy assembly line to munch on one of Mrs. Claus' Christmas cookies. Ok then, time for me to scoot my boot. Enjoy your weekend! TGIF and can you believe I have the day off?! I plan to spend the entire day crafting and organizing my crafty room. Lisa actually inspired me with a post she did about re-organizing all her 6x6 paper pads by theme rather than company and I want to do the same thing. I've already been working on getting all of my 12x12 Christmas and Halloween papers together which is quite a process but I'm being reacquainted with sheets that I'd forgotten about and all sorts of inspiration has hit me! Now it is time to do the same with the unruly hoard of 6x6 pads that stare at my back while I try to get work done, LOL! All that paper and my card today only uses the front cover sheet of the Mistletoe Magic collection by My Mind's Eye. I know I've mentioned it before but when I put these collections away I can never bring myself to throw away the cover sheets with all the little prints lined up on them. So even if it isn't cutting into those papers I am glad to get this used up and on a card. In fact, the rows of prints kinda reminded me of a cozy quilt which for some reason had me reaching for my Gorjuss Girl stamps. Winter Wonder hadn't seen ink yet so she was just the girly to pull this card all together. Well, I guess I should go tackle that pile of paper pads. I can't remember that last time I inked up a Kraftin' Kimmie stamp and that is such a shame because I love these crazy eyed cuties so much. Now that I'm thinkin' about it, the Moonlight Whispers stamps being on hiatus all these months is probably a big reason why I've neglected using them more... out of sight, out of mind and all that jazz. 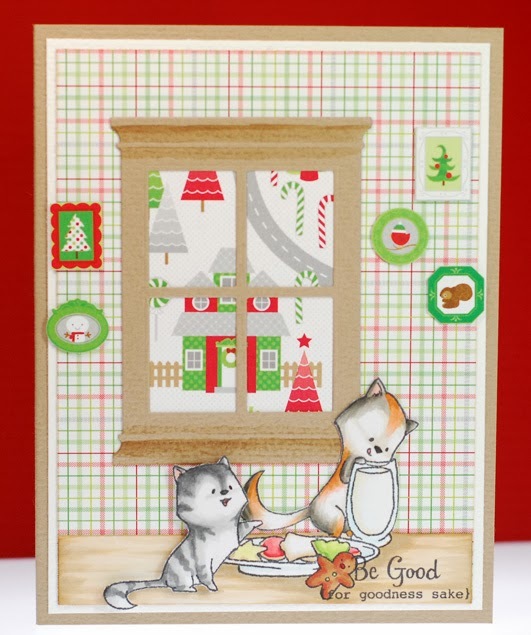 But since I was going to be using one on my card I decided to check out the KK blog to see if there was a challenge going on that I could play in and while I was there I saw a little sneak peek for Saturday's release and I am SO excited! The Moonlight Whispers are back and I can't wait to see all the new stamps! Alrighty chicas, I'm off to get this day started... have a good one! So today's card is for the Farm Fresh Challenge over on the TGF blog. It is to use washi tape on your card and since I just got this cool OA chalkboard looking Christmas washi recently it was a great excuse to tear into it. That lead to me finally trying my hand at the chalkboard stamping technique with the Rudolph Headlines stamp and I'm pleased with how it turned out. Once I had that all done I needed a cutie to be heading into the reindeer show so I did a bit of altering and used Wild Sprout Gracie's head (minus the pigtails) with Wild Sprout Gigi's body. I love how her sweater dress looks with that jaunty cap, now she's all dressed up for the winter weather. Okey dokey, thanks for stopping by... I'll catch ya on the flip side! We've got a Christmas winner! It's time to announce the winner of this month's Sweet November release! Congratulations Grace! Please email me at: pete_danger @ hotmail.com with your mailing info and I will get your prize sent out as soon as possible. Our weather has finally turned and there is snow low on the surrounding hills. It's only a matter of time now before I'll be stuck driving in the white stuff. Hopefully my car will be up to the task, it is a big reason why I got a Subaru after all... everyone told me that they are great winter cars. Alrighty stampers, have a great day and a wonderful weekend. I'll see you back here tomorrow with a winner of the Midnight's Christmas candy! This week's challenge is to use the color brown on your card so I searched out the MME Lost & Found paper pad from last year because I love the color combo in it which includes a very dark brown. Of course I colored her up to match and even added a touch of gold to the mix for good measure. I also stamped in a little village scene to help ground her in the foreground. Perfect Pearls substituted for a gentle snowfall and I finished off the card design with some strips of paper that I trimmed into pennants and an old epoxy brad from my stash. Well I guess I should go do the hair and makeup thing before heading off to work. Christmas mischief and some candy! Up at the North Pole in Santa's Christmas village, Mrs. Claus has a new furry friend to keep her company during Santa's busy day away. It may seem strange to name a snow white kitten Midnight, but being at the top of the world they see their share of midnight sunshine and Mrs. Claus has always had a sense of humor. And Midnight is quite mischievous, keeping Mrs. Claus and all those elves on their toes. They can't forget to hang the fragile glass ornaments higher on the trees otherwise Midnight is right there to bat and swat at the entertaining baubles until they fall and break. Oh and don't' even think about leaving wrapped packages out before Christmas eve because Midnight will waste no time tearing into those pretty papers just to play with the ribbons and hide inside the boxes. When she works up an appetite, Midnight will sneak into the kitchen looking for Santa's plate of cookies and glass of milk to pilfer. She may try to be careful but you just know that that milk will be all over the table before you can bat an eye. And when she finally gets a bit sleepy, Midnight heads into the bedroom but it isn't the bed she is looking for... nope, only one of Santa's extra hats will do for her to curl up and cat nap on. Despite all the trouble she gets into everyone in the workshop loves and adores this little Christmas kitty. 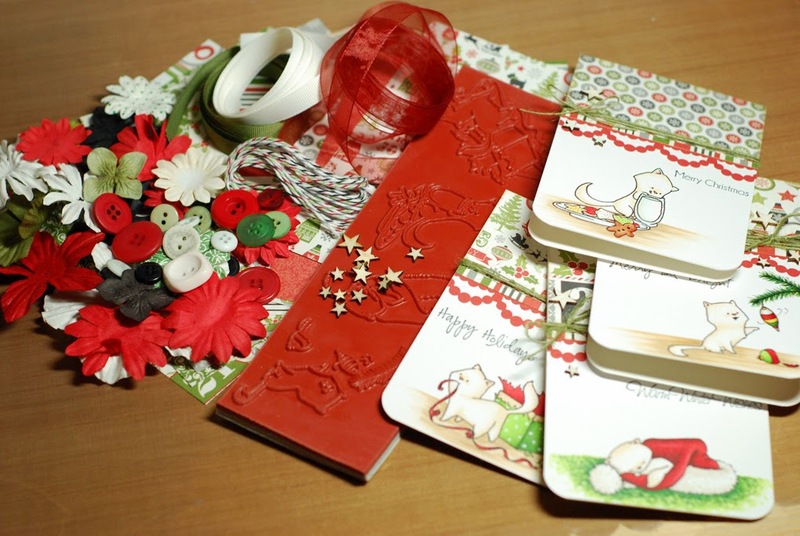 The Midnight's Christmas candy kit includes; Sweet November Midnight's Christmas rubber stamp set, ten 6x6 sheets of Echo Park 'Tis the Season paper, Prima flowers, Kaiser Craft pearls, ribbon, twine, buttons, Studio Calico wood veneer stars, four envelopes, four card blanks and my card. All you have to do for a chance to win the candy is leave a comment on this post. If you link to the candy on your own blog that is great and much appreciated but not a requirement... I want everyone to be able to play along. And when I say everyone, I mean everyone. I will ship the candy anywhere in the world so everyone is encouraged to play! :) The candy will stay open through Friday, November 8th and I will announce the winner on Saturday, November 9th. Instead of using random generator I will be printing out names and tossing them in a hat SO if you leave a comment for the SN Gals on their blogs, you will get an extra name in the hat... this will up your chances of winning the candy. Fun, fun, fun! 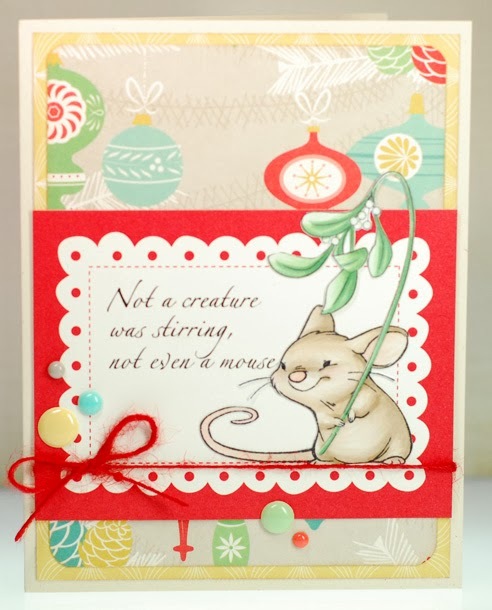 Well, that's all there is to this one and done SN November sneak peek. There are more previews over on the CCD blog today with another chance to comment and win so don't miss that as well! 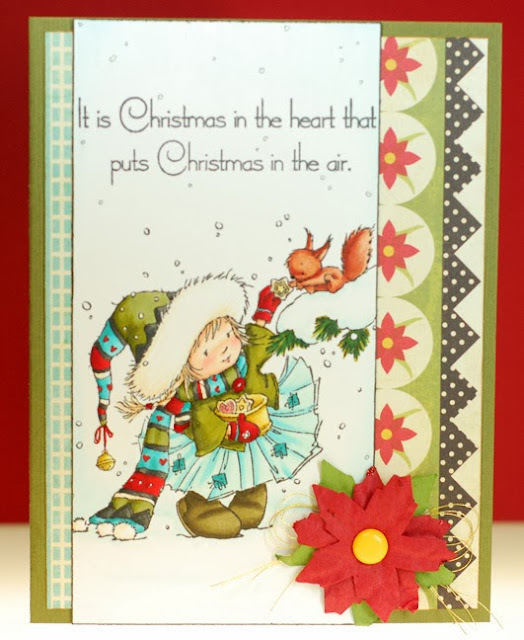 Don't forget... November stamps and dies will be available for purchase at the CC Designs store Thursday, November 7 at 9am EST! The rest of the CCD team have even more fantastic preview cards to share with you over on the CCD blog today. As always, there are chances to win the new stamps while you are there so don't miss that! 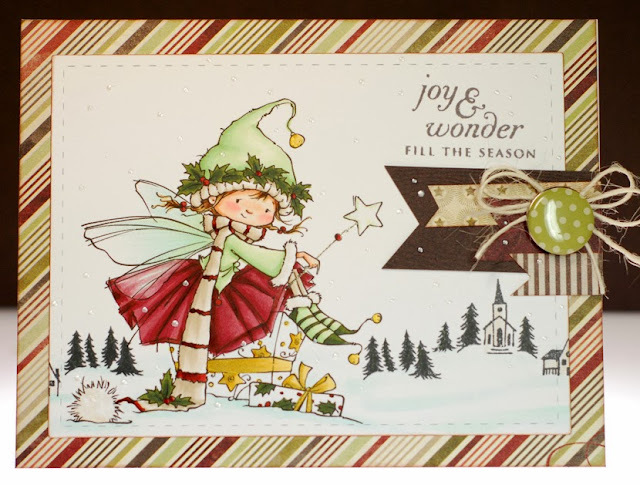 And Winter Hoodie along with the other November stamps and dies will be available for purchase at the CC Designs store Thursday, November 7 at 9am EST. 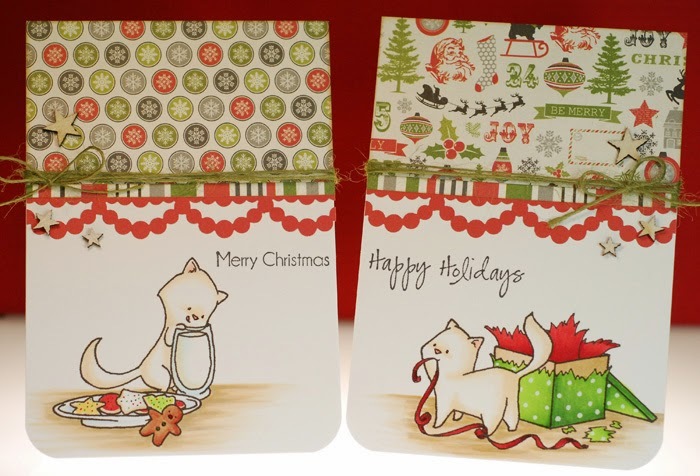 I'm thinking of taking some time and stamping up a bunch of my Christmas images all at once, printing out any digis too, so that I can quickly see at a glance what I have to work with for this upcoming holiday season. It would definitely let me see how many I have yet to use so that I can finally get them crossed off my list. I'll let you know how that goes if I actually get around to it today. Okey dokey then... thanks for stopping by and hey, enjoy that extra hour if you got to 'fall back' today too.